Description: StarFox 64 was Nintendo's first true 3D scrolling shooter (The original was 2D/3D). 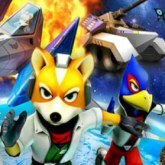 Fox McCloud is assigned missions across the galaxy by his commander.Fox and wing-men Peppy Hair, Slippy Toad and Falco Lombardi are on a mission to save the galaxy and its planets. Through there journey they will face other airplanes and ground units as well as bosses at the end of each level. After you defeat a level you can choose branching paths on the level map, so if you want to beat all levels you will have to play it a second time through! Game Controls: Enter Key = Start Button. "W,A,S,D" Keys = Move. "K" Key = Shoot. "J" Key = Toss Bomb. "L" Key = Use Brake. Press "SpaceBar" Key Twice = Barrel Roll. "I" Key = Change View. Select option icons located at the bottom of the game screen to edit controls, Play In Full Screen, Save/Load game progress, and change graphics settings.